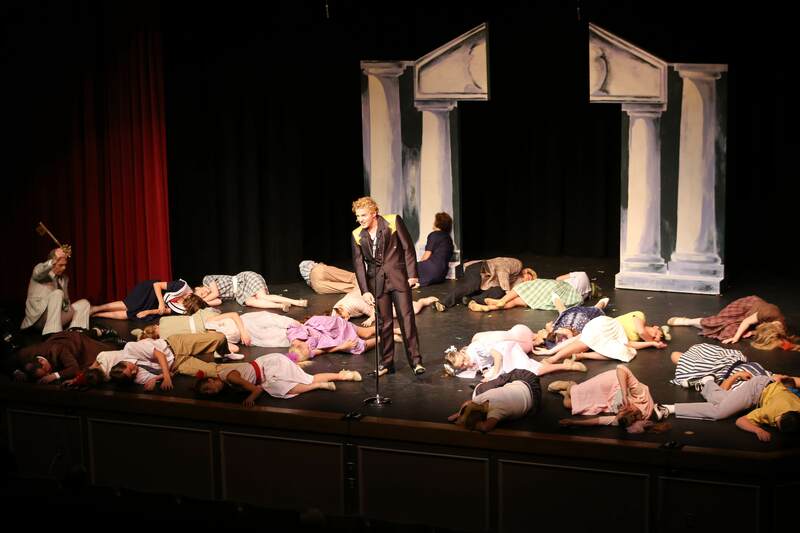 USP’s “Bye Bye Birdie” is a Finalist for four ICTA Awards. The link below is a PDF download with information about the Festival and Registration form. Union Street Players closed the final curtain on the summer musical, Bye Bye Birdie, this past Sunday afternoon. Positive word of mouth from the first weekend of shows created a swell of ticket sales in the second weekend. Congratulations to Director Denise Gregory, Producer Deb Linn, and their fantastic cast and crew for a job well done! Bye Bye Birdie Tickets NOW ON SALE! 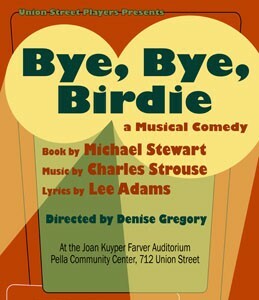 Union Street Players, Pella’s award winning community theatre, is excited to announce that tickets for our summer musica, Bye Bye Birdie, are now on sale! Originally titled Let’s Go Steady, the satire on American society is set in 1958. The story was inspired by the phenomenon of popular singer Elvis Presley and his draft notice into the Army in 1957. The rock star character’s name, “Conrad Birdie,” is word play on the name of Conway Twitty. Twitty is best remembered today for his long career as a country music star, but in the late 1950s, he was one of Presley’s rock ‘n’ roll rivals. This musical with its 50′s nostalgia and rockabilly music is sure to be a crowd pleaser for the whole family! All performances will be on the stage of the Joan Kuyper Farver Auditorium in the Pella Community Center (712 Union Street, Pella, IA). Thu Jul 25 @ 7:00 p.m.
Fri Jul 26 @ 7:00 p.m. Sat Jul 27 @ 2:00 p.m.
Fri Aug 2 @ 7:00 p.m. Sat Aug 3 @ 7:00 p.m.
Sun Aug 4 @ 2:00 p.m. The easiest and most efficient way to order tickets is to do so online by clicking here. The USP Box Office (641-204-1094) can arrange to purchase tickets with a credit card, but please realize that the Box Office will simply do the on-line purchase for you (it’s easier for you to do it yourself). The USP Box Office is a virtual box office, there is no physical box office for you to visit to purchase or pick-up tickets. If you do not have on-line access or cannot purchase tickets with a credit card, the Box Office will work with you to make alternate arrangements. If you have a Warm Welcomes coupon or Patron Voucher, please call the Box Office to arrange redemption or simply exchange them for a ticket at the door (subject to availability). Director Denise Gregory has announced the cast list for Union Street Players’ summer musical Bye Bye Birdie. Performances are July 25-27 and Aug 2-4 on the stage of the Joan Kuyper Farver Auditorium in the Pella Community Center. Tickets will be on sale on line approximately one month prior to the show. Check back at http://www.unionstreetplayers.com for more information. “Bye Bye Birdie” Auditions THIS WEEK! Auditions for Union Street Players summer musical, Bye Bye Birdie, will take place this week. This popular Broadway musical, set in the 1950’s, is loosely based on the stories of music icons Conway Twitty and Elvis Presley. The catchy 50’s music soundtrack and comical story of love and teen rebellion in the 1950s has made it a popular show for decades. USP’s production is being directed by Denise Gregory and Produced by Deb Linn with Musical Direction by Anne Petrie. No experience or preparation is necessary. Rookies, novices and newcomers are welcome. No roles are precast! Auditions will be held in the Joan Kuyper Farver Auditorium in the Pella Community Center, 712 Union Street, in Pella. Perusal scripts are available for check-out at the Pella Public Library. If you have questions or would like more information, please contact Denise Gregory at denise2352004@yahoo.com.